**Please note: The SVG version requires Photoshop CC 2017 or Illustrator CC 2018 (or newer) to employ. ** However a Regular version is also included in a traditional font format which is widely supported. 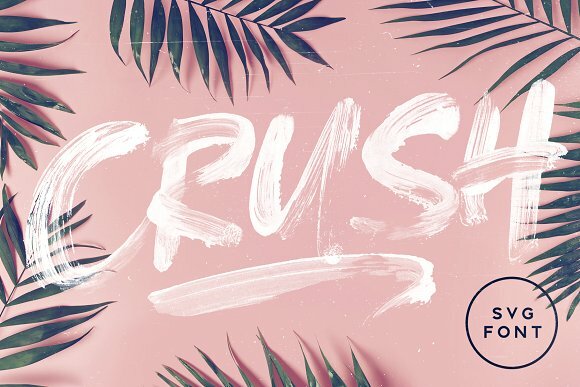 Introducing **CRUSH**; A messy, loud & proud all-caps brush font which embraces imperfection. CRUSH uses fresh Opentype-SVG font technology to provide super high resolution paint strokes completely **built in** to the font as a transparency – just simply type away and let the font enact it’s magic. It’s guaranteed to create a immense impact as large display text on product packaging, advertisements, posters, cover designs, social media & more. 1. **CRUSH SVG.otf** – SVG version of the font containing high resolution, built in textures (Requires Adobe Photoshop CC 2017 or Adobe Illustrator CC 2018 or newer). 2. **CRUSH Regular.ttf** – Regular version of the font; employ this version if you need the font in a traditional vector format, but still maintining an authentic rough paintbrushed finish to it’s edges. **Alternate Characters** • CRUSH Also includes **two sets** of each letter, allowing you to mix up your characters and create truly authentic, customised text layouts. Just simply switch between upper & lowercase on your keyboard to switch between the two letter sets. **Language Support** • Is provided in the Regular version only, for the following languages; English, French, Italian, Spanish, Portuguese, German, Swedish, Norwegian, Danish, Dutch, Finnish, Indonesian, Malay. Now what are you waiting for, bag out there and CRUSH it! (See what I did there ). A font description published on Monday, July 16th, 2018 in Display, Fonts by Andrei that has 1,475 views.